I used to wish I could touch the clouds. In my mind, they would be squishy like marshmallows, and a gentle squeeze would release perfect, individual raindrops that would hold their fluid shapes like glass. Note: my imagination wasn't exactly rooted in science! These days, the view from my basement studio is mostly sky. Watching the clouds roll by brought that ethereal inspiration back to mind, and my saturation collection began with the cloud series. 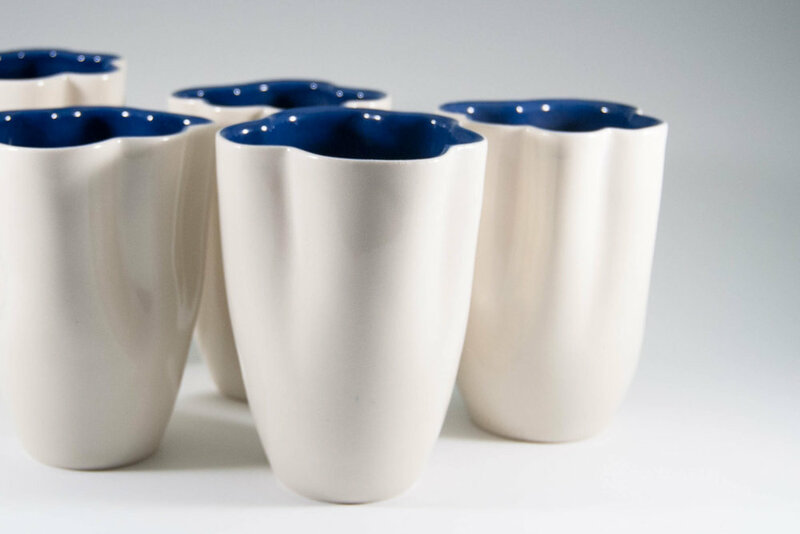 I make altered curves in wheel-thrown porcelain to create a sense of airy weightlessness in each vessel, allowing light and shadow to act as the only surface decoration. I add deep blue slip to the interiors to counter the airiness with a sense of fullness, and tiny watercolor drops on the bottoms to pay homage to their impending cloudbursts. I also recently added the droplet series, harking back to my imagined glassy raindrops. The series begins with hand-built bowls, formed with ultra-thin porcelain to emphasize their delicacy and fluidity. Their deep blue interiors reflect the cloud series, while the addition of subtle slipped brushstrokes call to mind the calm beyond the storm. More ideas are in the works to expand this cozy collection fit for even the most minimalist dinner table.